I’ve made salmon lots of times before, but I’ve always cut the skin off. This was just the right recipe to try something new without being too far out of my comfort zone. It was super easy, and if nothing more, increased my desire for better cooking dishes (I’ve got my eye on this All-Clad set) so as to make sure my pans get an even heat – which is ideal for pan-searing foods. (Especially scallops, which are just to die for). The best part of this dish was the sauce. Who knew that mixing grapefruit, butter and pinot noir was going to be the best thing ever? Holy cow, this sauce was great. The only alteration I made to the recipe was that I did not cook the spinach. I really am not a fan of wilted or cooked spinach, so I left it straight up raw. I also didn’t serve the dish with grapefruit segments, because as you can imagine, I’d been cooking pretty much all weekend, so yeah, I could do without that extra work. Try this one for yourself – it’s really, really good! Go cook! Preheat an oven to 200 degrees F.Preheat a large saute pan with 3 teaspoons of the olive oil. Season the fillets on both sides with 1 teaspoon of the salt and 1/2 teaspoon of the pepper. Sprinkle the skin sides evenly with the sugar.Place the salmon in the pan, skin side down, and cook until it is nicely browned and caramelized, about 3 minutes. Flip over and cook on the other side for 1 to 1 1/2 minutes. Remove from the pan, place on a small ovenproof dish or platter, and place in the oven to keep warm, skin side up.Add the remaining olive oil and butter to the pan and once the butter is melted, add the spinach and remaining salt and pepper. 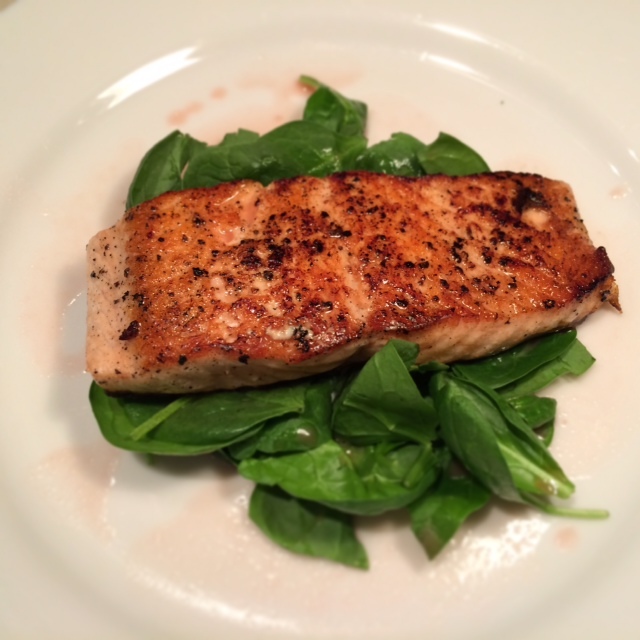 Cook the spinach until wilted, 3 to 4 minutes.Serve the salmon by dividing the spinach among 4 warmed entree plates, place a piece of salmon on top of the spinach, and drizzle the sauce around the plate. For the Pink Grapefruit Pinot Noir Sauce:Place all the ingredients except the butter, basil and grapefruit segments in a 1-quart saucepan and place over high heat. Bring to a boil and reduce until the liquid is slightly thickened. Reduce the heat to low, remove pan from the heat, add a few cubes of the butter and use a whisk to stir constantly until the butter is melted. Return to the heat and add a few more pieces. Continue to place the pan on and off the heat, adding a few cubes of butter at a time, and whisking until all the butter is used. Remove the sauce from the heat and strain through a fine-mesh strainer. Stir in the grapefruit segments and chiffonade of basil and keep warm until ready to serve – do not allow the sauce to boil or it will separate.